The Morsø Firepit is an ideal choice for anyone who likes comfort, creating a great atmosphere in the garden. Imagine sitting with a glass of good red wine in your hand and your eyes resting on the living fire – isn’t that a cosy picture? 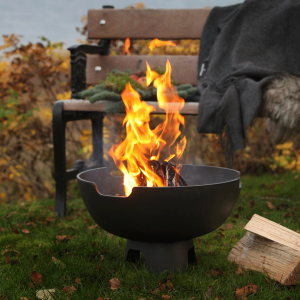 The firepit is designed on the basis of Morsø's old series of cooking equipment. With its clean lines and simple, functional design, it also serves as a beautiful decoration on the patio or at the front door. The firepit is made of solid enamelled cast iron and therefore never rusts if it is used and cared for correctly.